Whether you’re a seasoned chef or entering the kitchen for the first time, it is almost impossible to avoid a minor burn at some point while cooking. You may also sometimes get singed while lighting up a candle or a firecracker. Even exposing yourself to the sun for too long can scorch your skin and lead to a severe sunburn. Once you sustain a minor burn, the first step is to put the burned area under cold running water to take the heat off the burned skin. If the burn is severe and you are in immense pain, seek immediate medical help. If the burn is bearable, the next step is to allow the skin to heal and protect it from infections. You can provide your skin the necessary nourishment for faster healing, which brings us to these amazing DIY homemade burn salves. These salves contain natural ingredients that are potent antiseptics, help alleviate the pain and prevent the formation of a scar after recovery. Here are three tried-and-true DIY homemade burn salves recipes that will surely help take the heat off your burn and heal it in no time. Honey has been used for ages to protect and heal wounds. Manuka honey, in particular, is considered to be potent for skin healing. It contains a compound called methylglyoxal, which is a strong antibiotic. Honey, in contact with the skin, also releases hydrogen peroxide that helps disinfect the area. Hydrogen peroxide also aids in cell regeneration to heal the charred skin quickly. The lavender essential oil in this recipe works as an analgesic to relieve the pain and irritation. 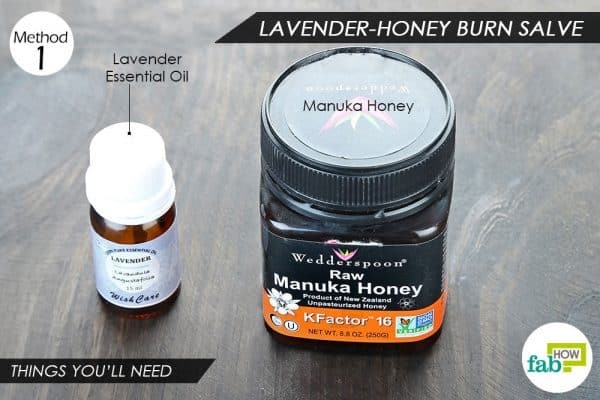 Note: Manuka honey comes in different potencies. Buy one with the highest UMF (Unique Manuka Factor). The higher the UMF, the higher the concentration of methylglyoxal in the honey. 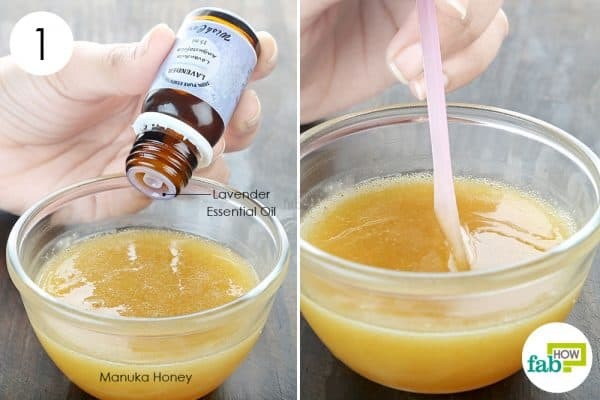 Pour ¼ cup of Manuka honey into a bowl. Transfer the blend to an airtight container. For use, clean the burn with cold water and pat the area dry. Use your clean finger to apply the blend to the burn. Dress the area in sterile gauze to keep it protected and let it work for 3 to 4 hours. Applying this salve will provide you instant relief from irritation and pain. Reapply 2 or 3 times daily for 1 to 2 days or until the burn is completely healed. You can store the honey & lavender burn salve in the refrigerator up to 1 year or even longer unless it gets contaminated by dirty hands. Another honey-based salve that works equally well in healing minor burns is a blend of honey, coconut oil, and aloe vera gel. 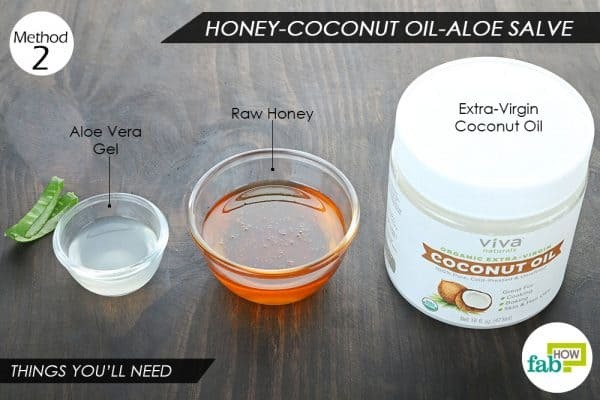 While the honey helps keep the wound protected, the coconut oil works as an antibacterial agent to kill any invading pathogens. Coconut oil is also rich in nutrients and fatty acids that provide the necessary nourishment to help the skin recoup faster. The aloe vera gel, another popular skin-healer, contains hormones called auxins and gibberellins that speed up wound healing. It also boosts collagen production in the skin and prevents the formation of scars. You can also use this DIY homemade burn salve to soothe a severe sunburn. Pour ¼ cup of raw honey into a bowl. 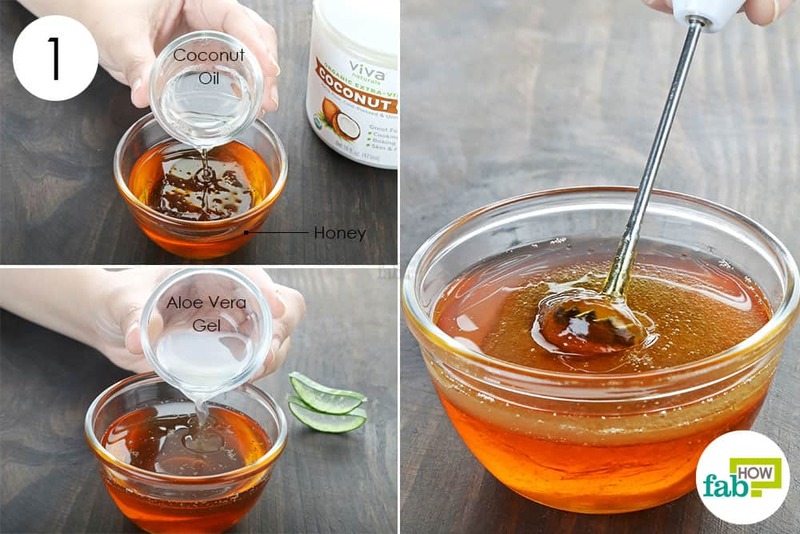 Add 1 tablespoon each of aloe vera gel and extra-virgin coconut oil. Use a motorized hand blender to whisk up the ingredients. 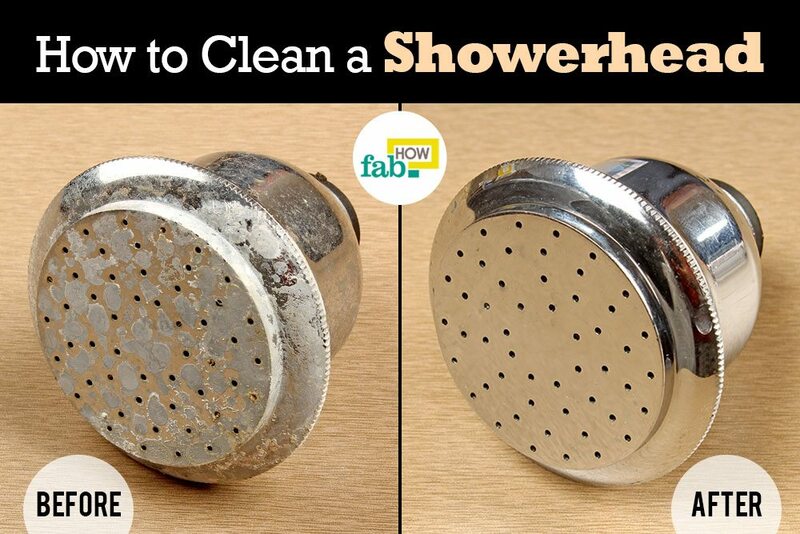 Pour the blend into a shallow tin container. Allow it to solidify. You can refrigerate it to speed up the solidification. Clean the burned skin thoroughly with cold water and a mild cleanser. Spread a thick layer of the salve over the affected skin and cover it with medical gauze. Let it work for 3 to 4 hours, then reapply and replace the gauze. Apply this salve 2 or 3 times every day for 2 to 3 days or until the minor burn heals completely. Store the prepared salve in the refrigerator at all times. The shelf life of the salve is 2 to 3 weeks. 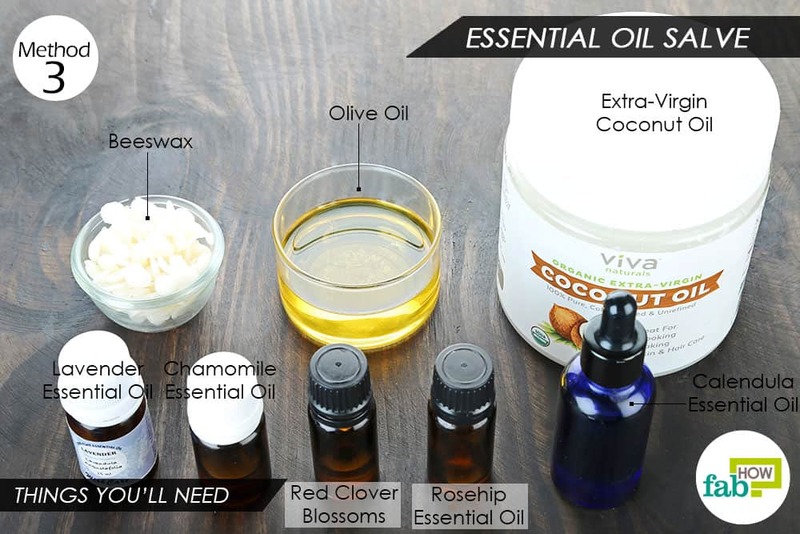 Coconut oil can also be used in conjunction with therapeutic essential oils to relieve the pain and irritation of a minor burn. Along with the coconut oil, this particular salve contains olive oil that deeply moisturizes the skin to help it recover quickly. The beeswax gives the salve its waxy texture and forms a waterproof layer over the burn to keep it protected. The essential oils impart antiseptic, anti-inflammatory and analgesic properties to the salve. 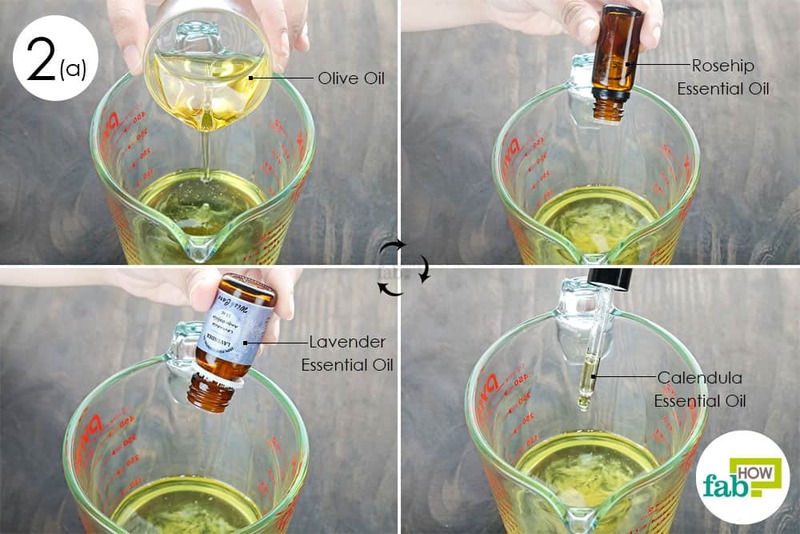 The oils used in this recipe are rosehip, calendula, chamomile and lavender essential oils, and red clover blossoms infused oil. Caution: Since this recipe contains a blend of potent essential oils, do a patch test first on healthy skin before applying it to the burned area. 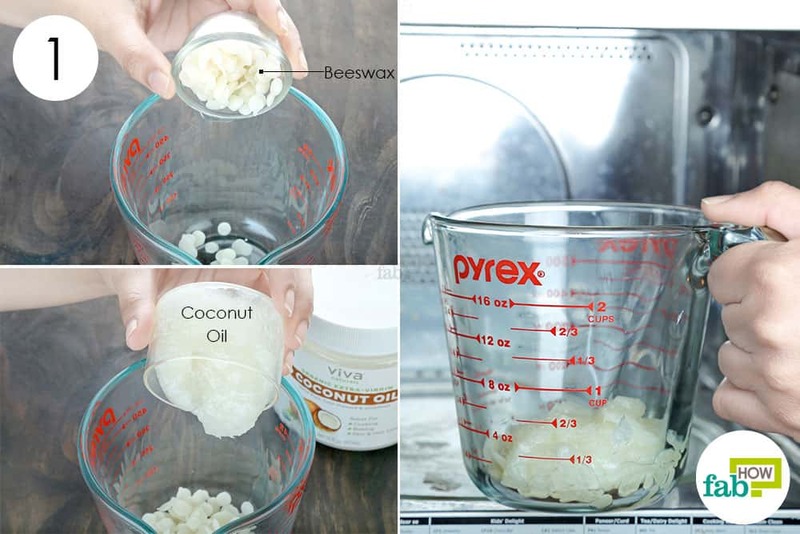 Put 2 tablespoons of beeswax in a microwave-safe container. Add ¼ cup of extra-virgin coconut oil to it. Microwave the ingredients on high in 30-second bursts until the two melt completely. Retrieve the container from the microwave and allow the blend to cool down a bit. Add ¼ cup of olive oil to the melted ingredients. Add 10 drops of rosehip essential oil. Add 10 to 15 drops of calendula essential oil. Add 10 to 15 drops of chamomile essential oil. 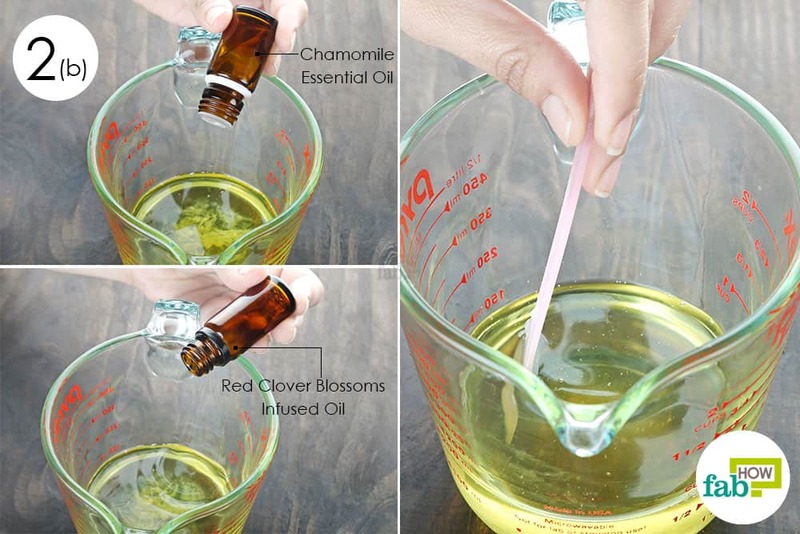 Add 10 to 15 drops of red clover blossoms infused oil. Pour the prepared blend into a glass container. Screw on the lid and allow the blend to solidify completely. Clean the burn and apply the salve liberally over the affected skin. Cover it with medical gauze. Leave it on for 2 to 3 hours, then reapply it. 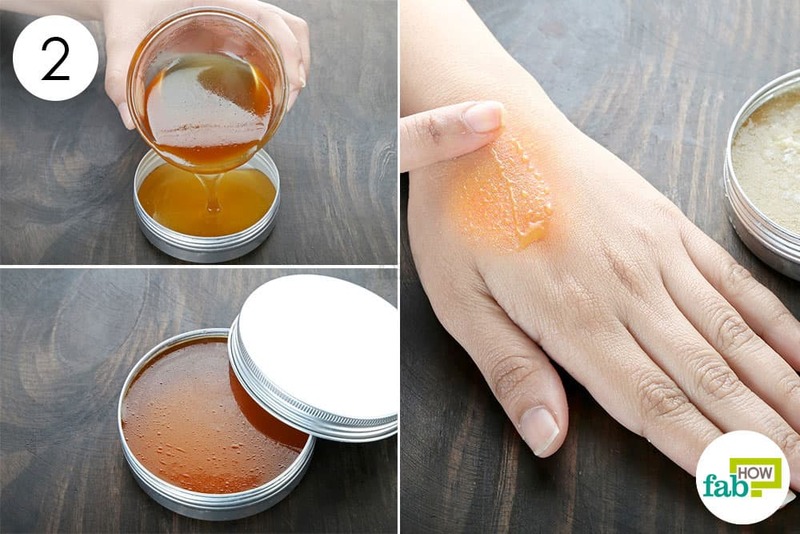 Continue applying the salve 2 or 3 times every day until your skin heals completely. The shelf life of this DIY homemade burn salve is 6 months when stored in a dark and cool place. After pretreating the burn with cold running water, you can also clean the area by swabbing it with diluted apple cider vinegar. It will replenish the skin with essential nutrients and help normalize the skin’s pH for faster recovery. Burned skin often develops small blisters. Do not try to pop them, as it can delay the healing process and lead to the formation of a scar. These DIY homemade burn salves are meant for superficial burns only. Do not try using them on electrical burns or second- and third-degree burns. In any such case, rush to an emergency department immediately.